Our range of products include cnc sawing machine. To meet the diversified requirements of our prestigious clients, we are engaged in introducing CNC Sawing Machine in the domain. Utilized in a variety of industrial sector and applications, this machine is made using high quality materials and approved components. Consequently, clients benefit the advantage of removable frame structure, overloading protection system, high output energy and long service. The offered machine can work using hydraulic and electricity. Beside this, clients can also avail the machine at industry leading prices from us. 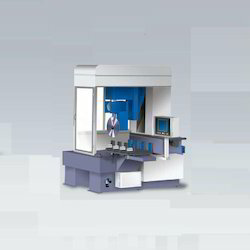 Looking for CNC Sawing Machine ?